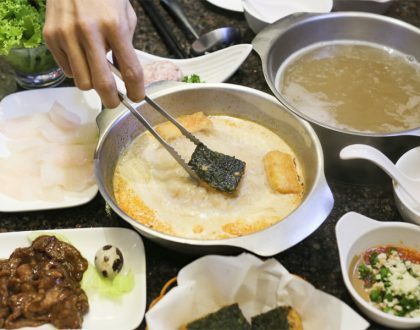 “Chengdu” is the UNESCO declared city of gastronomy that travellers visit for spicy Sichuan food (and the giant Pandas); and the name of the NEW Chinese restaurant at 74 Amoy Street. 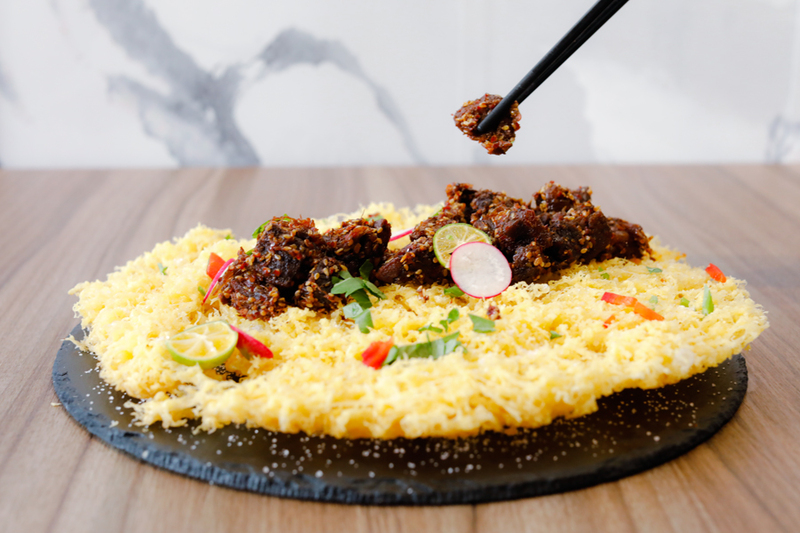 Singaporeans’ understanding of Szechuan food may be limited to the usual staples of Mala Hotpot, Mapo Tofu, and Kung Pao Chicken. 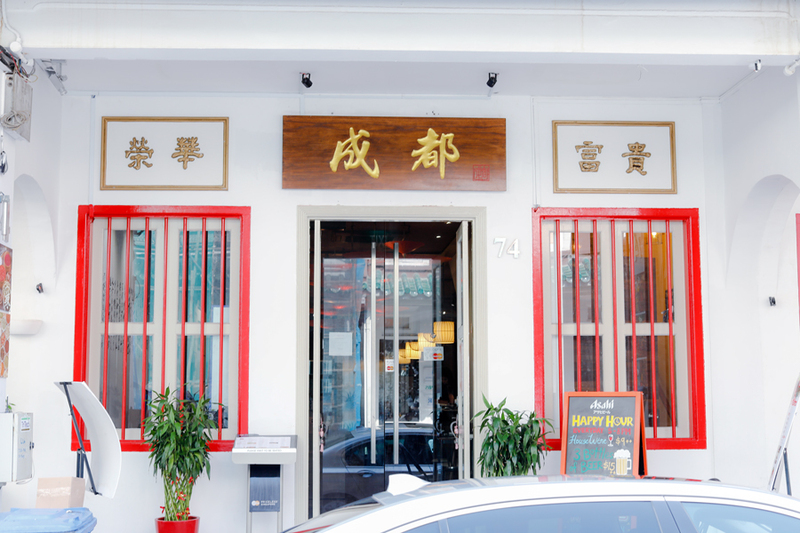 Over at Chengdu Restaurant 成都川菜馆, you get to experience a repertoire of dishes that you may not have seen elsewhere in Singapore, from Beggar’s Chicken, Bangbang Duck, “Ants Climbing A Tree” – which is actually minced meat cooked with glass noodles. 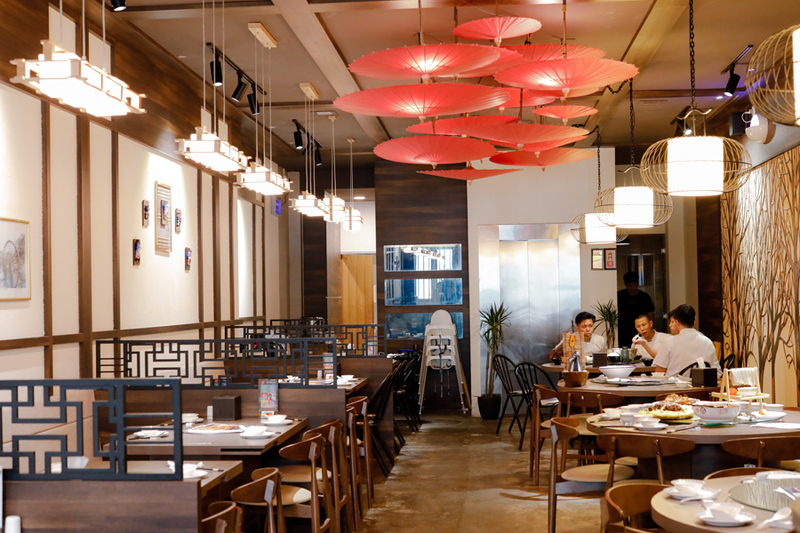 Helming the kitchen are Sichuan restaurant chefs Qing Jun and Jing Xiao. Both chefs have notable experience working at famous hotels and restaurants, previously served dignitaries and celebrities. 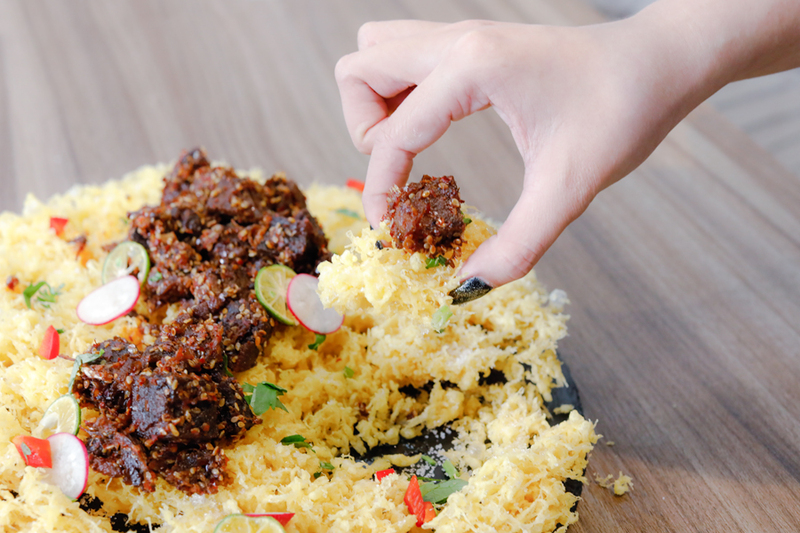 When I asked if the food is tamed down to suit Singaporeans’ tastebuds (because our spiciness tolerance level is not quite there yet), the reply was that a good-half of the dishes are like what they serve back home. So get ready to sweat it out. Of course you can make your request to have dishes ”less spicy” or “very authentic”. If you are not familiar with names of Chinese dishes, the chances of ordering “Beggar’s Chicken” may not be high. One of the legends goes that a beggar with no available utensils found a chicken, wrapped it with clay, buried the bird and cooked it. 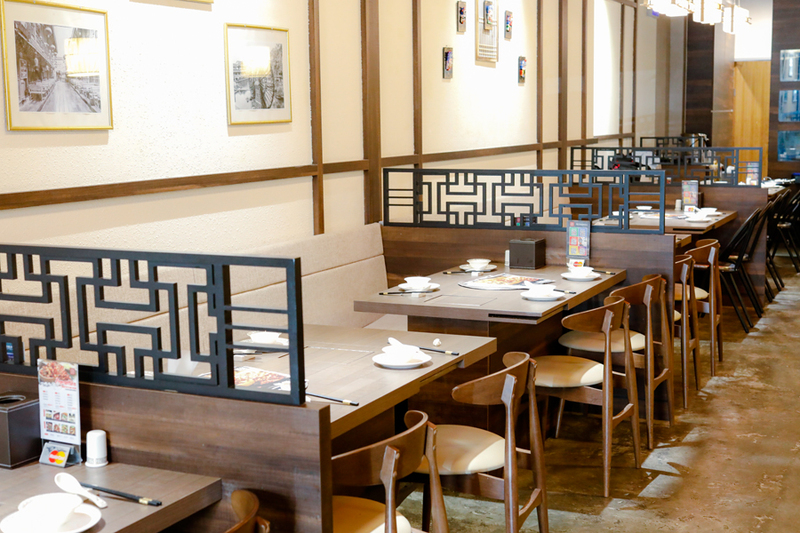 The emperor who walked by was attracted by the aroma, and demanded that to be included in the imperial menu. 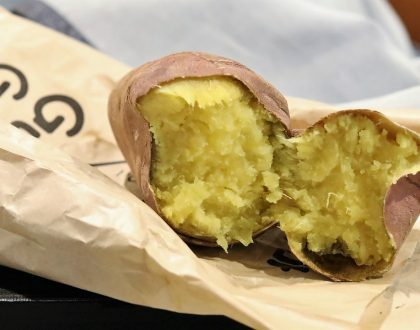 Therefore, Beggar’s Chicken is stuffed chicken, wrapped in clay, then slow-baked at low heat for hours. 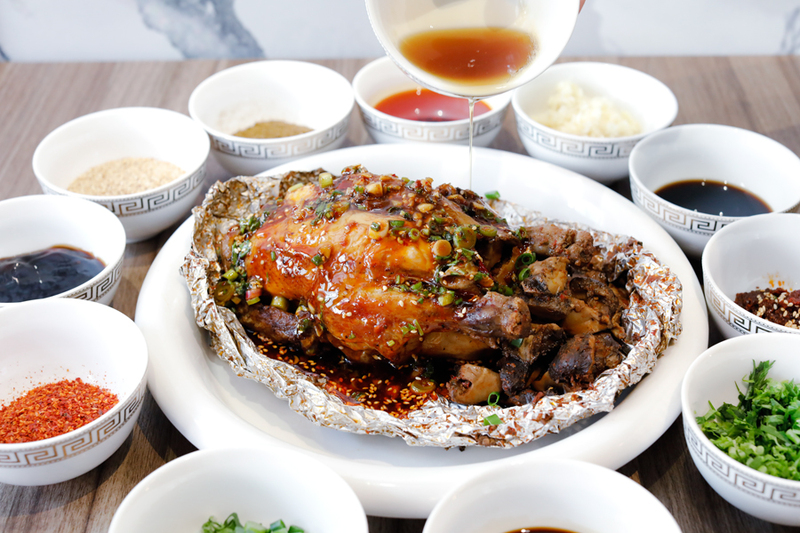 Chengdu Restaurant’s version of the Beggar’s Chicken features kampung chicken stuffed with fragrant mushrooms, marinated with Sichuan spices, wrapped in lotus leaf and tin foil, covered with clay then baked in a special earthern-ware jar over charcoal fire. You could imagine that the juices and flavours would all be locked in, and I particularly loved the mushrooms drenched in those flavours. 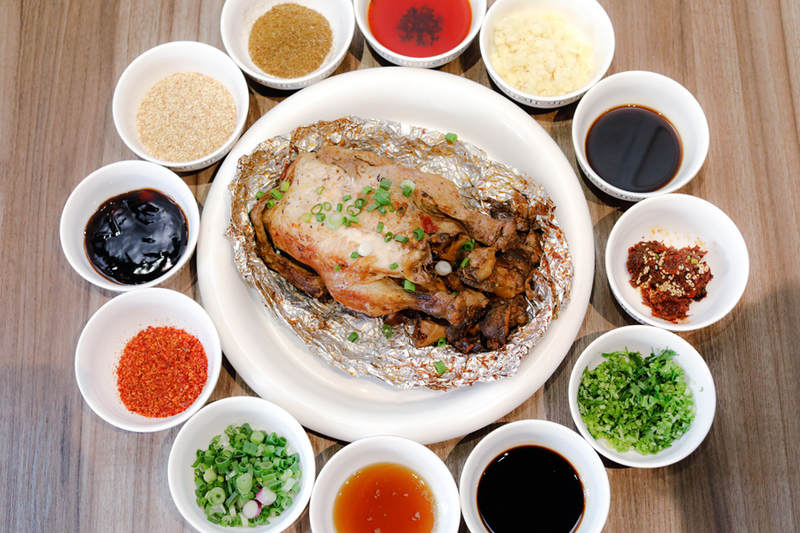 The chicken is also served with 12 kinds of sauces, hence the name “The 12 Flavours of Chengdu”. 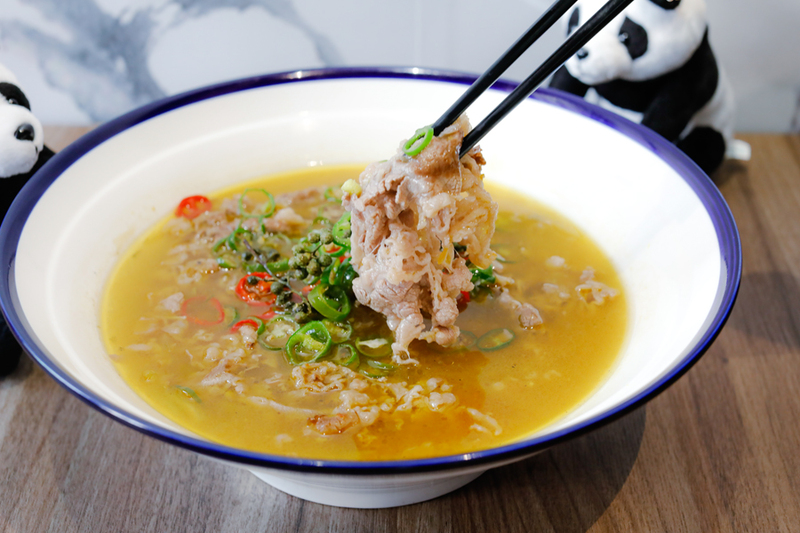 Perhaps you may not need to try all 12 as the chicken meat is tasty on its own, but do go for the special “Chengdu Sauce” which has moderate mala (spicy and numbing) flavours. Limited quantities, needs to be ordered one day in advance. 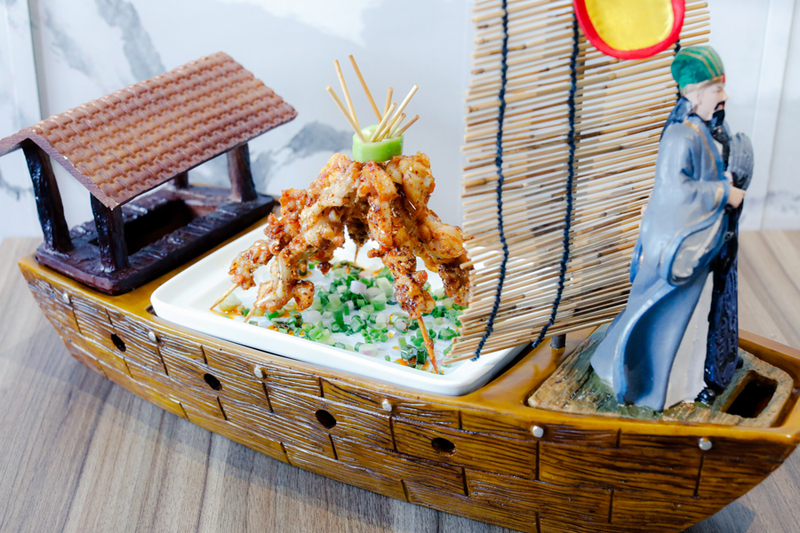 Having skewers of flash-fried fresh bullfrogs presented on a boat with a Chinese scholar figure, added with audio and ‘fog’ created by dry ice may seem OTT or gimmicky to some. I suppose the Frog Skewers represent the supply of arrows. How clever. This could have been a great history lesson, and would have been great if there was some form of explanation either from the menu or the serving staff. But now you know. Food wise, the Frog Meat was slightly crisp on the outside, brushed with a special Sichuan sauce for some tingling, and tender on the inside. Somewhat like softer form of chicken. A dish I have never seen before in my life. 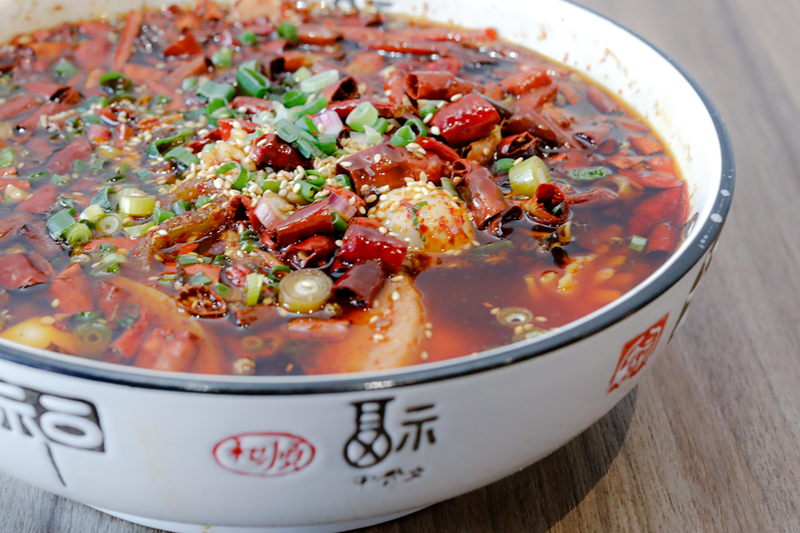 The top contained pieces of spicy beef cubes first boiled in Sichuan-style spicy marinade, air-dried, then simmered in sauce for a couple of house. You are supposed to eat them with the crunchy fried honeycomb corn pastry. I really liked the sweet corn base which reminded me of a snack I had as a child, though eating it together with the beef cubes felt cumbersome. My suggestion would be to eat them separately, and you could relish each on its own. 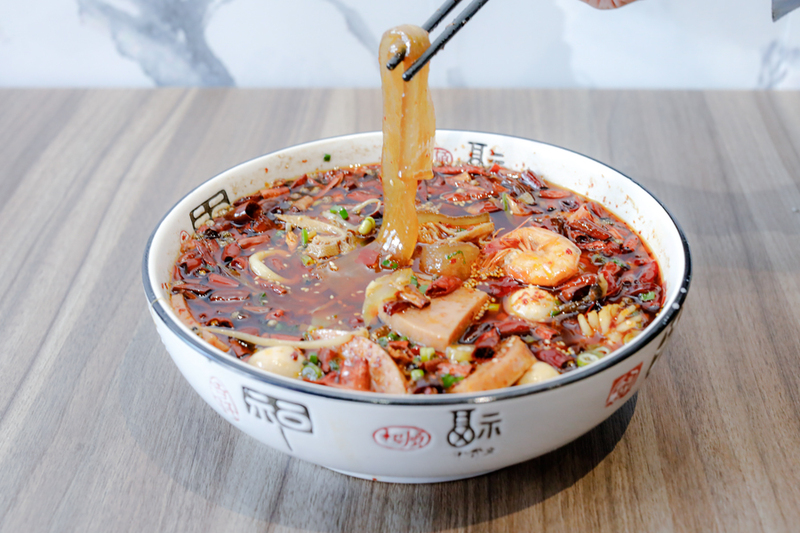 The Sichuan “Shui Zhu Yu” or Boiled Fish in red Sichuan pepper and other spices was probably the most trending dish in China at one point in time. Consider this the green-coloured version of the classic dish. Green Sichuan pepper and green chillies are used instead, which are in fact more numbing, with robust flavours and certain citrusy fragrance. 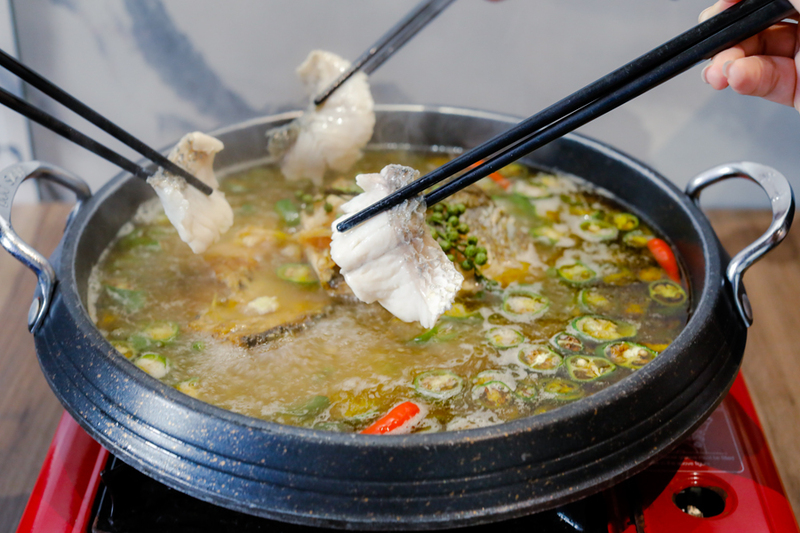 The soup stock is cooked with these spices, fish head, squid and fermented black beans. With the addition of special Sichuan pepper oil, I will provide ample warning to get a cup of water at hand if spices are not your thing. While the soup with all that cut green chillies looked incredibly fiery, I found it manageable though I won’t encourage dunking a bowl of that alone. The restaurant only uses live fish delivered daily, and is only prepared upon order to ensure tenderness of the fish meat. 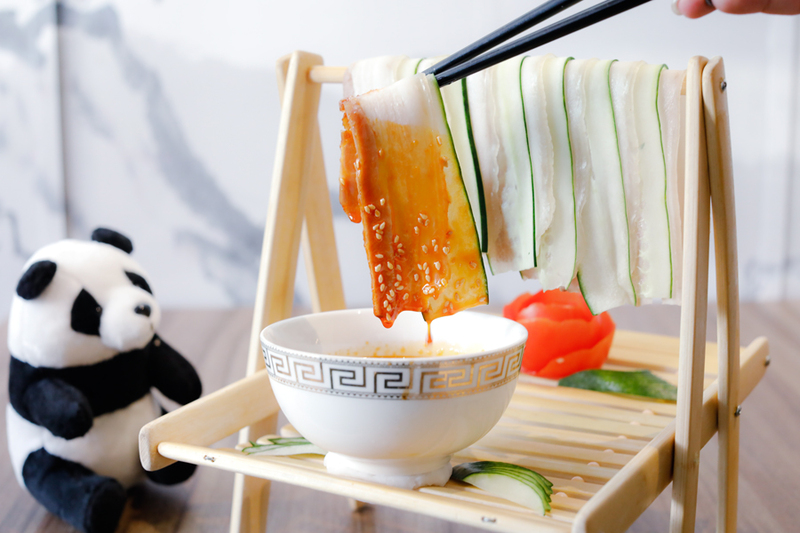 Instead of having the cold dish served on a plate, the pork belly slices are hung from a rack. Pick up a piece with a thinly-cut cucumber slice, and dip into the aromatic red chilli oil and garlic sauce. The starter was spicy, savoury and refreshing at the same time. Could be a travesty entering a Chengdu Restaurant without ordering a ”wang hong” 网红 (popular on the Internet) “Mala Xiang Guo”. 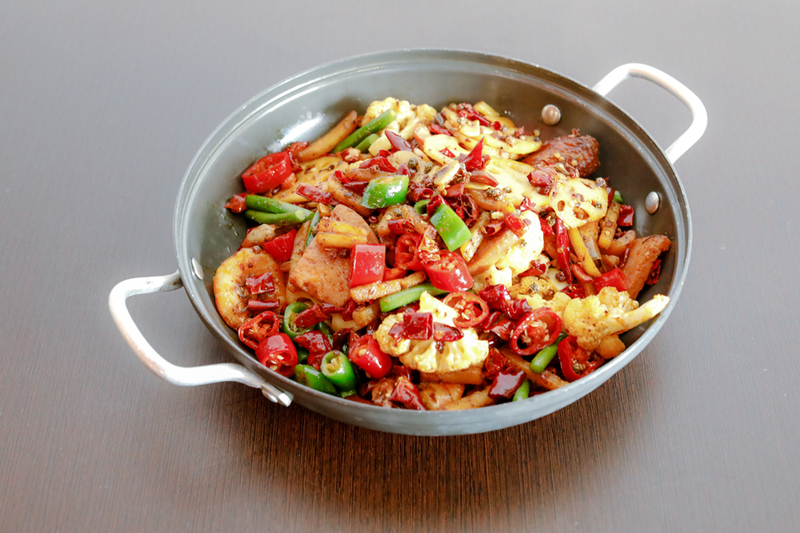 The popular pot consists of a variety of ingredients wok-fried in high heat together with tongue-numbing sauce. The vegetables used tasted like they were flash-fried, especially the lotus roots and cauliflower which were remarkably crunchy yet retained the moisture. 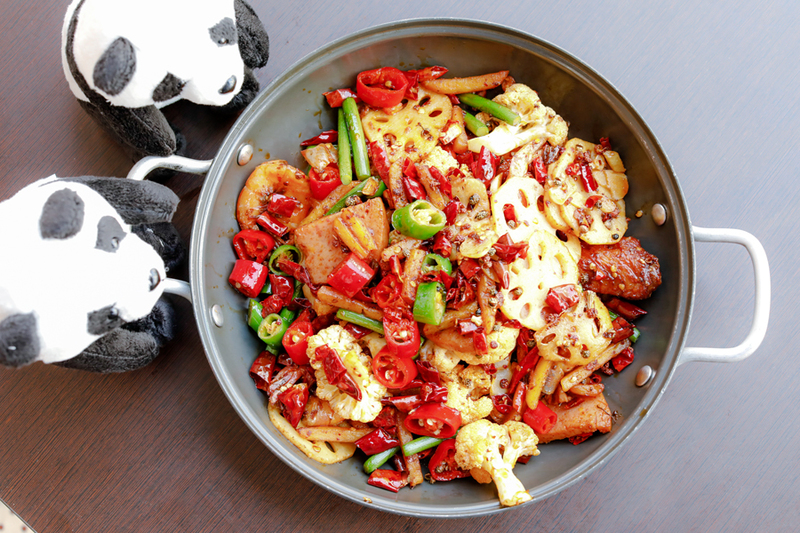 Loved the spam and long potatoes (which reminded me of French fries) coated in an addictive spicy-savoury sauce. If there were some enoki mushrooms included, it would have been complete. 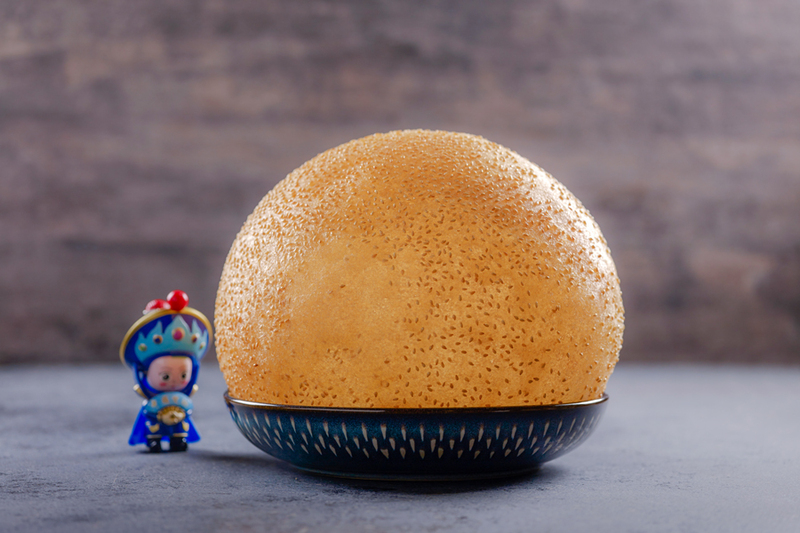 I didn’t get to try this as it was sold out (meh), but the Giant Sesame Ball with its size requires a skillful chef to create. Handmade, proofed for hours, crisp-fried for 20 minutes, order this glutinous ball the first time you do to avoid any regrets. 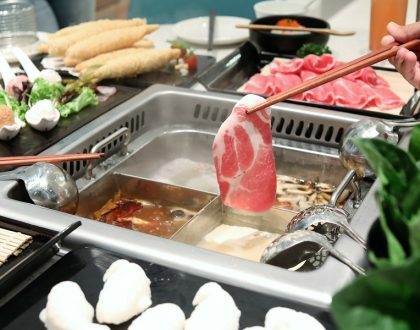 While some Chinese Restaurants may serve up Sichuan cuisines which have been muted, Chengdu Restaurant’s focus is still on offering authentic Sichuan cuisine in a modern setting with some fanciful presentation. 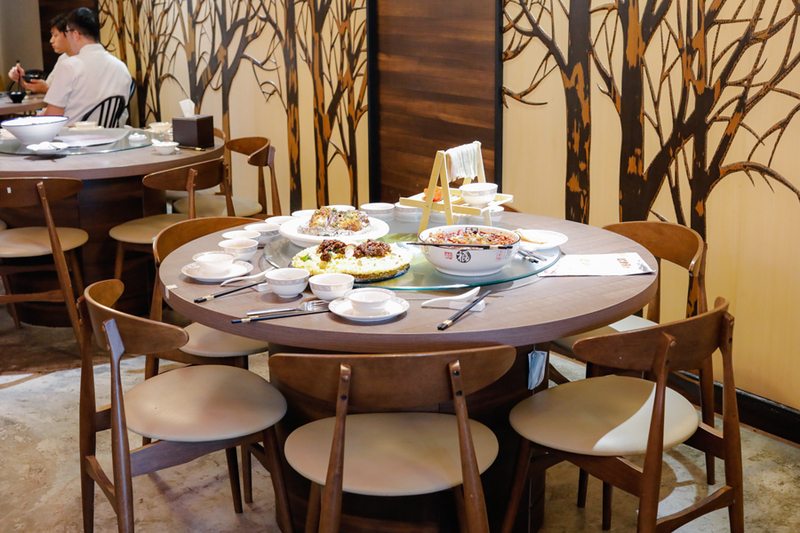 The menu is quite wide-ranging – with the offering of 76 dishes (I counted) from cold starters, “health care” soups, sides, vegetables, seafood and Sichuan signature dishes. It keeps me intrigued enough to want to try more the next time. * This entry is brought to you in partnership with Chengdu Restaurant. Is it only me? 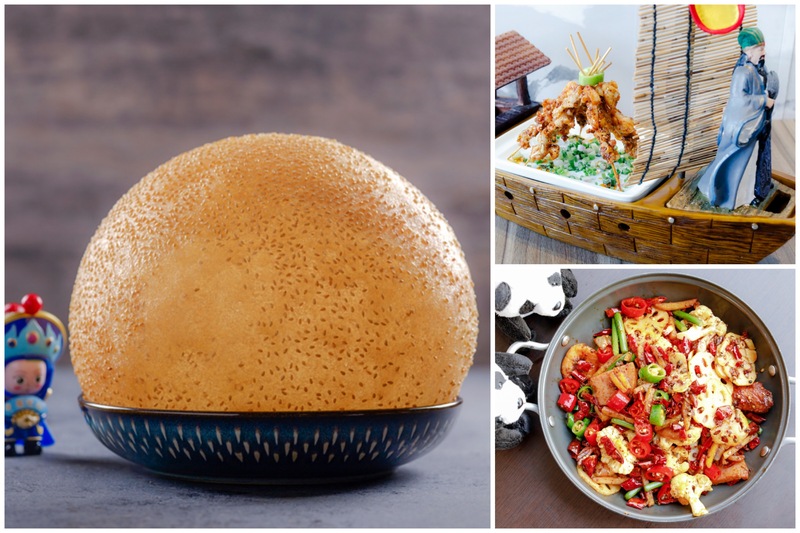 The sesame seeds on that giant ball are triggering trypophobia!